Be On The Lookout For Robber Jones! 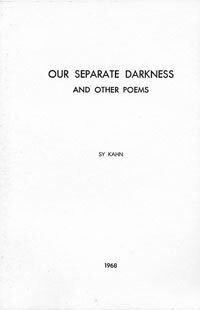 "Sy Kahn has written a book of poems as personal and I believe as humanly involute as any collection of poetic expression published in these tormented days. . . . here we have the whole gamut of the poet's feeling. This is a first edition of first poems, many already published in the little magazines of the era. The content of the volume is impressive because of the continuing strength and richness of the cosmogenetic image. One can feel sure that there is much yet to come of flesh and stone and of sun and moon that with conviction will be skillfully expressed by the poet." Our meeting and our birth. Giant's jewels, the moon a white torch. It was a bare room and often cold. Came down like a wall. Flagellation. Then was the moon our jailor. Then when we took light blows together. And we returned to our separate darkness. And the circling, golden cars. In the burning summer light. Watching the golden horses go.